Heat oven to 350°F (325°F for dark or nonstick pan). Spray 15x10x1-inch pan with baking spray with flour. In large bowl, beat bar ingredients with electric mixer on medium speed until well blended. Spread evenly in pan. Bake 19 to 24 minutes or until top is evenly golden brown and toothpick inserted in center comes out clean. Cool completely, about 1 hour. In medium bowl, beat cream cheese, butter, milk, vanilla and cinnamon with electric mixer on low speed until smooth. Gradually beat in powdered sugar, 1 cup at a time, until smooth and spreadable. 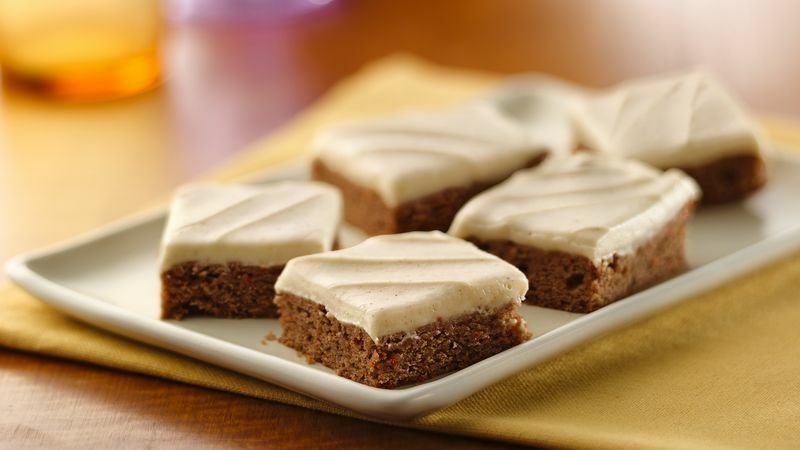 Spread frosting evenly over cooled bars. Store covered in refrigerator.